This is a gift from Israel with a personal touch. 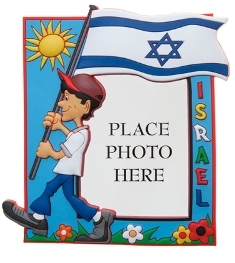 While most souvenirs from Israel are a generic product, this picture frame allows you to add your own favorite photo. If you’re looking for a fun Israeli gift with a touch of creativity, take a close look at this personalized picture frame. It allows you to place your favorite photo at the center of the picture frame. This is a perfect reminder of the country, particularly if you’ve just been to Israel or have friends and relatives in the country. Surrounded by a fun design, which incorporates an Israeli flag carried by a smiling character, this is a special gift.